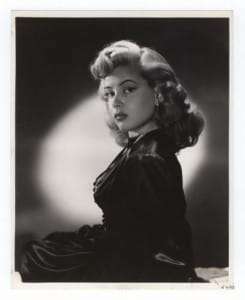 Gloria Mildred DeHaven was born on July 23, 1925 in Los Angeles, California, the daughter of actor-director Carter DeHaven and actress Flora Parker DeHaven, both former vaudeville performers. She began her career as a child actor with a bit part in Charlie Chaplin’s “Modern Times” (1936). She was signed to a contract with MGM Studios, but despite featured roles in such films as “The Thin Man Goes Home” (1944) and “Summer Stock” (1950), she did not achieve film stardom. She portrayed her mother in the Fred Astaire film “Three Little Words” (1950). DeHaven also appeared as a regular in the television series and soap operas “As the World Turns”, “Mary Hartman, Mary Hartman” and “Ryan’s Hope”. She was one of the numerous celebrities enticed to appear in the all-star box office flop “Won Ton Ton”, the “Dog Who Saved Hollywood” (1976), and has guest starred in such television series as “Robert Montgomery Presents”, “The Guy Mitchell Show”, “The Rifleman”, “Wagon Train”, “The Lloyd Bridges Show”, “Marcus Welby, M.D.”, “Gunsmoke”, “Fantasy Island”, “Hart to Hart”, “The Love Boat”, “Highway to Heaven”, “Murder, She Wrote” and “Touched By An Angel”. In the late 1960s and early 1970s, DeHaven hosted a morning call-in movie show, “Prize Movie”, on WABC-TV in New York City. DeHaven has been married four times to three different men. Her first husband was actor John Payne whom she married on December 28, 1944 and divorced in 1950. Her second husband was Martin Kimmell; they were married June 21, 1953 and divorced the following year. She was married to Richard Fincher from 1957 until 1963; they remarried in 1965 and divorced in 1969. She has two children with Payne, daughter Kathleen Hope born 1945 and son Thomas John born 1947. She has two additional children with Fincher, son Harry born 1958 and daughter Faith born 1962. Measurements: 34-24-34 (Source: Celebrity Sleuth magazine).